Alpaca Farm Days came and went !!! Look for this in 2018 about the same time as 2018 September 22, 23 from 1-5 each day. Will have alpacas to view, lead, touch, and discuss their care for just raising and breeding, as well as show. This is a fun day for people interested in learning about alpacas as well as those who are already involved. Will have alpacas to sell as well as alpaca products in the store. 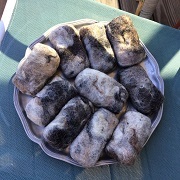 New items--Alpaca dryer balls that are the potential of eliminating the dryer sheets with chemicals from your laundry. People claim they save 30% drying time. You use three in your dryer. They will last for years. You will see them in the picture above. Alpaca Tea--for your plants--1 bag will serve three gallons of water for your house plants, and then bury outside near one of your garden plants as it is biodegradable and will contribute to further growth there. We have added the Alpaca Plant Passion that come in 4 oz shaker jars as well as the 9.5 oz to help keep your house plants healthy. You just shake the Passion on to the plants, and water afterwards. 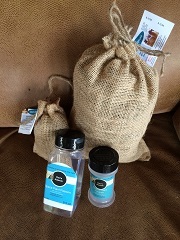 We have the 22 oz bag that will serve you to make ove five gallons of healthy water for your plants, inside or outside. Another product that will be coming soon are the fire bricks for the outdoor fires. And it is all 100% alpaca--no additives. 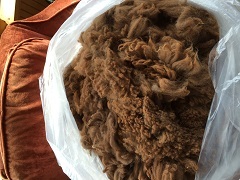 We have raw fleece that just came off the alpacas, in blankets, seconds, and thirds for your various needs and in various colors. Microns are between 14 and 18 so very fine . We sell it by the ounce or by the full blanket. Hand Spinners-we have rovings in multiple color combinations also. 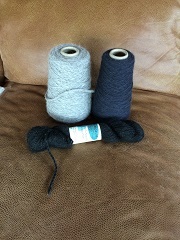 Our new yarn has arrived as well!! It is exciting to see the new rovings, and the new 500 yard cones. We still handle the skeins and the 1000 yard cones as well. Contact us at for an appointment to the Country Cottage. 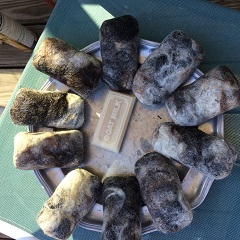 Felted Goat Soap--Soap with your washcloth or Soap with a sweater. The newest items are the felted soaps of many fragrances, like Apple Jack,, For Men Only, Sensitive Skin, Autumn Harvest, Unscented, all with Aloe Vera. We also have the goat lotion in a variety of fragrances. The biggest seller is the BugOff Lotion either regular or extra strength that wards off mesquitos, flies, tics, and other insects. We are also using it for the horses. The lotion has no Deet in in , thus is completely natural. The lotion comes in 8 oz bottles as you see in the picture, or in 4 oz on special order. The fragrances are similar to the goat milk soap as well. We also carry the soap in regular 4 oz bars in a variety of fragrances.